I dedicate this page to all who understand the joy of a good cup of tea. Lapsang Souchong tea comes from China's Fujian Province and Taiwan. The unique flavour of Lapsang Souchong is produced by lying the leaves out on bamboo trays and allowing smoke from pinewood to permeate through them. 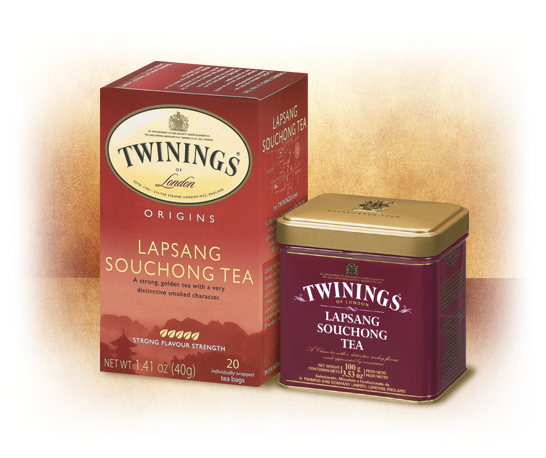 Twinings Lapsang Souchong is an adventurous tea with a unique smoke flavour and a dark rich colour. Drink with or without milk. This is one of three samples I received from Twinings. For years I have avoided lapsang like the plague. I couldn’t imagine enjoying a heavily smoked tea. Having sampled some really good loose leaf smoky teas lately, I am feeling brave. This is a bagged tea but its Twinings and they seldom disappoint. Removing the bag from the envelope and sniffing reveals a strong scent akin to putting your face in the cold ashes of a fire pit. I am not afraid. Well, maybe a little. I steeped with boiling water for only a minute and a half. The room now smells of smoke and it reminds me of bacon. It’s making me very hungry. The sip immediately brings two things to mind. First, a little over a year ago I would have tasted this and gone, “Eeeeew, Ick!” Today I am thinking this is not bad. Second, I am impressed at the complexity of the smoke flavor in this bag. It moves from the mouth to the throat and then into the nostrils. This is definitely the most heavily smoke tea I have had to date and I am liking it. The aftertaste is long lingering. The base is Fujian and Taiwanese teas. I really can’t comment on the choice of base leaf as I can’t separate it from the smoke. The second cup from the same bag :) I steeped at three minutes. It is much sweeter. For a brief instance I think I taste leaf, then it disappears again. This cup tastes like pulled pork barbeque. Liking this one a lot. Third cup! Yes, a third cup. Steeped five minutes. It is lighter but still very flavorful. My exposure to lapsang is limited but this is pretty good tea. From Twinings website the loose leaf version of this tea has been discontinued. 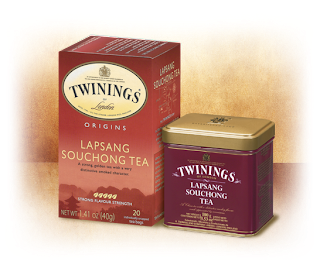 I would really like to know why Twinings discontinued Lapsang Souchong in it's old traditional package...? Unknown - see the word 'and' between Fujian AND Taiwanese? This is a blend of both. Thanks for caring enough to write. Looking to get the word out? I would be happy to review your tea on this blog and Steepster. Simply drop me a note. Having a passion for tea and living in rural America is not the best combination. Your choices can seem limited and often you can feel quite alone. Sound familiar? For years it was my pleasure to discover the best in grocery store and specialty shop tea. More recently, I have begun experiencing the world of fine loose leaf tea available on the Internet. As I continue to learn and grow in the ways of tea, I will be sharing my personal journey on The Everyday Tea Blog. I hope you join me.